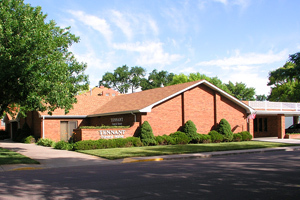 Tennant Funeral Home & Crematory is proud to have the finest facilities in northeast Colorado. Our funeral home is on one level and is ADA accessible to meet the needs of those with limited mobility. We have chapel seating for 215 people and also a video system that allows us to record or display the service on multiple screens throughout the facility expanding our viewing capacity for a service to over 300. A popular feature of our facility is an onsite reception hall with seating for up to 70 guests and total capacity for 100 guests. We often use our hall after funeral services, after Rosary services, and for less formal gatherings to remember a loved ones life. Our reception hall is also equipped with audio and video capabilities to display memorial videos or play a selection of your loved ones favorite songs during gatherings. Our selection room offers in person items for both burial and cremation services including 15 casket options, 11 vault options, and over 60 urns. We also have a large selection of keepsake jewelry and urns for those that would like to keep a portion of their loved ones ashes. We also offer a large variety of additional options that can be made from our supplier’s extensive catalogues of caskets, urns, and keepsakes.